Malpractice or Obesity: Can a 276-Pound Patient Heal a Pressure Injury? Obesity presents challenges to wound healing, but with knowledge and appropriate care interventions, we can provide optimal conditions to support the best possible outcome for every patient, no matter what size. The US obesity epidemic reached a new all-time high in 2016, according to newly released Centers for Disease Control and Prevention data.1 Every single state has an obesity rate greater than 20%, and in five states it’s even greater than 35%. Topping the chart is West Virginia, at 37.7%. The discovery process surely will reveal whether a patient was overweight or obese because nutritional status and body weight are factors in the healing process. The tricky part is deciding how much, if any, of the chronicity of the wound was because of obesity. In a recent case, the patient was 5′3″ and weighed 276 pounds. Can a person of this size heal? The defendants claimed they did everything according to the standard of care, but despite excellent care, the patient did not heal. They recounted some difficulty repositioning the patient because of her size and problems with moisture management in her skin folds. The plaintiff thought those were excuses and that there was size bias in the care given to the patient. So what are the facts when dealing with a larger patient with a wound? Posted in Litigation Wound Care, Nutrition | Comments Off on Malpractice or Obesity: Can a 276-Pound Patient Heal a Pressure Injury? 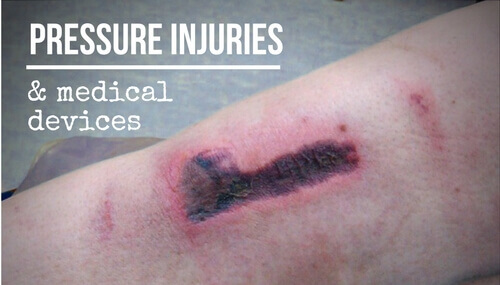 Medical device-related pressure injuries (MDRPIs) are a standard part of wound care, but preventative practices can make a big difference. One of the first things clinicians learn about treating pressure injuries is to find the cause of the pressure and simply remove it. Sounds simple, doesn’t it? But what do you do when the cause of the pressure injury is a medical device which is not only necessary, but literally sustaining a patient’s life? While some medical device-related pressure injuries are unavoidable, there are things clinicians can do to relieve the pressure and heal the injury. Here’s what you need to know. Most lawsuits start not because of poor medical care but because families believe promises were made and broken and they are angry. If you speak to any health care attorney about the proliferation of lawsuits against hospitals, nursing homes, and health care providers (HCPs) over the last decade or so, you will engage in a conversation peppered with a variety of legal terms. These may include breach of duty, negligence, malpractice, wrongful death, statutory standard of care, or even criminal culpability. It is important to understand that these are formal words with specific legal meanings, and at least a few of them appear on every plaintiff complaint as the reason for the lawsuit. This is in sharp contrast to every deposition I have ever read from a plaintiff—usually the surviving spouse or child/children of the deceased. These family members never use legal jargon. Instead, they use emotional terms that reveal the true reason they are suing. Unless the family member works in the medical field, they rarely criticize the actual medical care but rather express great sadness with the personal care and the way they were treated. Plaintiffs frequently remark about the lack of caring they felt in health care. It is these words that we must focus on if we are to understand the patient perspective and thereby improve patient satisfaction.